There's a global groundswell of support to build spaceports. In the United States alone, political and financial muscle is at work to install spaceports in a number of states, be it in New Mexico, Oklahoma, Texas ... as well as Wisconsin. Other states, especially Florida, are busy trying not to be left behind in the spaceport sweepstakes by pushing for new space-industry legislation. On the world scene, a Scotland spaceport has been touted. 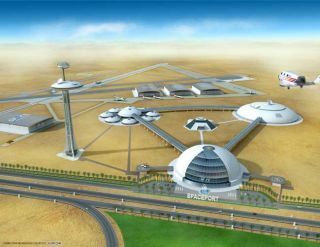 So too is building a spaceport in the United Arab Emirates (UAE). Also being advanced is Spaceport Singapore. Still, with all this hustle and bustle key questions remain: What is a spaceport anyhow? Moreover, can they be designed to accommodate the projected hunger for public space travel? In the past, numbers of spaceports have been advocated--but faltered for various reasons. The bottom line for a spaceport: It's a lot more than plopping down a launch pad. Since 1996, the Federal Aviation Administration's (FAA) Office of the Associate Administrator for Commercial Space Transportation (AST) has licensed five spaceports in the United States: California Spaceport at Vandenberg Air Force Base, Spaceport Florida at Cape Canaveral Air Force Station, the Virginia Space Flight Center at Wallops Island, Kodiak Launch Complex on Kodiak Island, Alaska, and the latest site to be sanctioned - the inland Mojave Spaceport in California. Overall, some three dozen operational spaceports are spread out around the planet--most of them government owned and operated. But the promise of scheduled spaceliners blasting off with ticketed passengers onboard is changing the spaceport scene. "One might look at a spaceport as an innovative, new century version of what you remember airports first looked like," observed Patricia Grace Smith, the head of the FAA's AST office. "They will be a gathering place for people to learn and witness, for the first time, the capabilities and benefits of space," she told SPACE.com. Smith pointed to New Mexico's spaceport intentions, the building of a "full-service" transportation entity for space. "So you'll be able to go and take suborbital rides and experience zero-gravity, but also become educated and aware of all the various aspects of space." Eric Anderson, president of Space Adventures, a leading space experiences firm headquartered in Vienna, Virginia, has remarked that "countries around the world are only just realizing the enormous commercial possibilities of space tourism." The market potential for suborbital spaceflights alone, Anderson suggested, is estimated at $1 billion annually. Suborbital flights will offer millions of people the opportunity to experience space travel, he said. By the end of the decade, in addition to the continued launch of spaceflight participants to the International Space Station--one flight line of business for Space Adventures--"we envision operational suborbital spaceflights and the launch of the first commercial circumlunar spaceflight," Anderson said. Space Adventures recently announced a contract with Prodea, a private investment firm, to develop a fleet of suborbital spaceflight vehicles for commercial use globally. "This joint venture, in addition to the development of spaceport locations around the globe, is a part of Space Adventures' effort to offer millions of people the opportunity to travel to space," said Space Adventures' Vice President of the company's Orbital Spaceflight Program, Chris Faranetta. Clearly stirring the space travel and spaceport pot is the talent whirlpool of British billionaire, Sir Richard Branson, along with aerospace imagineer and builder, Burt Rutan of Scaled Composites in Mojave, California. In July of last year, the twosome formed The Spaceship Company. That joint venture is focused on manufacturing and marketing spaceships for the suborbital personal spaceflight industry. The launch customer for the undertaking between Virgin Group and Scaled Composites is Virgin Galactic, Branson's commercial space tourism endeavor. Virgin Galactic has placed an order for five SpaceShipTwo vehicles and twin White Knight Two motherships, with options on further systems, thus securing the exclusive use of the systems for the initial 18 months of commercial passenger operations. Governor of New Mexico, Bill Richardson announced late last year a partnership with Branson to put in place a spaceport in the state. Branson's Virgin Galactic will locate its world headquarters and mission control for its personal spaceflight business at the New Mexico spaceport, with start of operations projected for 2009/2010. Rutan leaves no doubt that he's working hard to make good on delivering a fleet of Virgin Galactic spaceliners. There's also certainty in his voice that suborbital flight by paying patrons is near at hand. "I strongly believe that you're going to see within the next few years--certainly within a decade--proof that it is indeed very affordable and very safe," Rutan said at the International Space Development Conference (ISDC) held earlier this month. "There's going to be some cool things that you can do there," he added, with the suborbital passenger market far larger than most suspect. Oddly, spaceports are popping up but they have nothing to fly, Rutan noted, with investments spurred by very little information. "It's almost humorous to watch the worldwide battle of the spaceports...they're everywhere." That is a very comforting fact, Rutan continued. There's also a message there, he said: Given spaceliners that are robust, affordable and safe enough to fly the public "other money that will be needed will appear in front of our face immediately ... and I think that's pretty cool." Rutan has predicted big things ahead for the Mojave Spaceport. As reported in the Mojave Desert News, Rutan recently said that "significant infrastructure" will be erected at Mojave to handle the space tourism business, including new spaceliner assembly facilities to be built within the next few months. Adding a bit of competitive bite to his remarks, Rutan said that New Mexico may be good for military space operations, "but it's not good for us...we want our passengers to see the ocean," rather than just desert on their flights, the Mojave Desert News reported. Meanwhile, in New Mexico, several design teams have made their bids to scope out what the state's $225 million spaceport will look like. It will be built some 45 miles north of Las Cruces and 30 miles east of Truth or Consequence--an area near Upham selected due to its low population density, uncongested airspace, and high elevation. The New Mexico spaceport is already gearing up to carry out its first rocket launches, albeit unpiloted, from the site this year. "Our site activation process is nearing completion at the temporary launch complex in New Mexico. Everything is progressing smoothly," said Jerry Larson, president of Connecticut-based UP Aerospace, Inc. that is readying an inaugural suborbital rocket blastoff from the New Mexico spaceport grounds. The rocket for that first flight is in final assembly and will soon be transported to the spaceport, he told SPACE.com. "Our customers are performing final checkouts of their payloads and experiments prior to their integration with the vehicle," Larson said. "We're right on schedule for the multiple space launches that we have scheduled for this year." Evolving demand for low-cost human-rated reusable launch vehicles and rocket-powered racing aircraft. One preliminary guesstimate has suggested that the annual economic impact spurred by a Southwest Regional Spaceport in 2020 could be in excess of $750 million in total revenues, and exceed 3,500 jobs--including all commercial space cluster space transportation services and manufacturing activities, as well as tourism-related visitor spending. Derek Webber, Washington, D.C. director of Spaceport Associates, has taken a hard look at spaceport types. He makes the case that it is probably not a workable plan to attempt to cover all markets with a single spaceport. "There is emerging a polarization of spaceport providers," Webber observed. "Throughout the world, the already established government spaceports are likely to continue to provide expendable launch vehicle services to government, military and some commercial users," Webber explained. "Meanwhile, new commercial spaceports are emerging that will focus primarily on space tourism--both suborbital and orbital--and will thereby support the development of the reusable launch vehicle mode of spaceflight." It seems unlikely, Webber said, that a single, all-inclusive type of spaceport will emerge that is able to handle satisfactorily all the diverse kinds of spaceport business. Anybody engaged in the new spaceport boom should learn the lessons from the first one, said Thomas Matula of the School of Business at the University of Houston - Victoria. Matula explained at the recent ISDC that the first wave of spaceports occurred in 1989-1999. Those "fields of dreams", he said, were stirred up by such government projects as the Delta Clipper-Experimental (DC-X), the failed NASA-industry single-stage-to-orbit VentureStar program, and the privately-backed Kistler rocket. Eventually, reality set in, Matula stated. Often spaceports focused on single firms, so when the firm failed so did the spaceport. Those backing spaceports didn't ask the "hard" questions, he said, like what is the real demand for launch services? Also, did the launch firms really have viable business models? And are the proposed launch vehicles technically feasible? Matula said this time around, his counsel to spaceport proponents is that they must craft a realistic business model. Spaceports are business incubators, not transportation facilities. Start small and expand as needed, leveraging existing facilities before building new ones. Ask the hard questions about markets, revenues and viability of launch firms, he said. Above all, keep expectations down-to-earth and avoid fantasy traffic models, Matula advised.